The 18ft Water Slides is a single lane slide unit with front side easy climb access to a protective No-Jump area at the top of the slide. Kids love splashing in the water no matter what time of year! This big slide is bound to keep kids entertained for hours or adults for that matter. 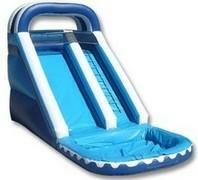 This unit can also be rented dry if you like and instead of water we can fill the pool with FUNBALLS. For times when water use isn't appropriate but you still want the fun factor.